In prevalent faiths or religions with holy books, such as Judaism, Christianity and Islam, the attitude towards individuals with Lesbian, Gay, Bisexual and Transgender and Intersex (LGBTI) sexual identity is very rigid. Every year the biggest threats against the LGBTIs who want to organize a Pride March come from the “nationalist Muslims.” As a matter of fact, in Turkey, nationalism, i.e. Turkism, and Islam are not thought of as separate things. Nationalism in Turkey receives acceptance as long as it is united with Sunni Islam. So much so that Turkmen Alevis were not accepted as Turks before the 1980s, and Christian Gagauz Turks were deported in the early years of the republic. It’s not possible for LGBTI members of the Semawi community to worship without hiding their identity. Because, based on past experience, we all know that they have no safety in the mosque they’ll enter. In Alevism, however, there is no gender discrimination. In the Alevi mass worship ritual, cem [pronounced as jam — Trans. ], everyone is referred to as “Can [or jaan, meaning “life” or “the essence which gives one life” but also used as a name with the extended meaning “dear” –Trans. ], Cem Saints” which are gender-free descriptions. There is no gender discrimination in Alevism, however, individuals who fail to comprehend Alevism, make gender discrimination and LGBTI discrimination as they do in other faiths. Despite many examples, there are still those who couldn’t grasp, understand, comprehend Alevism, those even arguing that women cannot take a “post” [a seat reserved for a high ranking leader in Alevi hierarchy –Trans.] and lead the cem. A couple of days ago, Alevis Union Federation in Germany made one of the most important statements of recent years and presented Alevis’ approach to jaans with LGBTI sexual identity which was not declared to public until now probably because there was no occasion. The statement with the title “the ka’bah of our belief is human, its pilgrim is jaan” included the following sentences; “Our association, not only disregards all the common prejudices against LGBTI (Lesbian, Gay, Bisexual and Transgender and Intersex) individuals but also does not consider the unwarranted statements based on these prejudices worth discussing. We refuse all the approaches, advocated by conservative fractions starting with the AKP, which make representation of homosexuals in public space difficult. As an association, we do not only fight against the marginalization of the Alevi community. Our belief that brings forth the concept of “Jaan,” instead of the concept of congregation that exists in panislamist societies, rejects every kind of discrimination. The Alevi community whose ka’bah is human, sees everything as a reflection of Haq [Allah, the fair and noble one — Trans.]. Our teaching does not discriminate based on language, religion, nationality, color, gender. Humanity is the most sacred value. We defend a social order that delivers all the rights extorted from all individuals starting from women, far from male-dominant understanding and rest on the ideal of equality amongst genders. *Alevism is a mystical branch of Islam whose adherents follow the teachings of Caliph Ali. The European Court of Human Rights (ECtHR) will announce its final judgment on March 10 in the case of a trans man in Turkey who was not granted court permission needed for gender reassignment surgery. The ECtHR will announce its final verdict on Y.Y. v Turkey case regarding Article 40* of the Turkish Civil Code on gender reassignment. What does Article 40 require? Article 40 of the Turkish Civil Code stipulates that a court permission must be obtained in order to undergo gender reassignment surgery. According to the article, the permission can only be given if the person is over 18 and unmarried and if the person has obtained official medical board reports to prove that the operation is psychologically needed and that the ability to reproduce is permanently lost. The applicant who wants to be registered as male and to get permission for gender reassignment surgery applied to a Court of First Instance in 2005. The next year, he got two different psychiatric expert reports in February and April, stating that he must continue his life as a man. However, following a report in May stating that the person still has the ability to reproduce, the court ruled that the applicant does not fulfill the requirements of Article 40. How can one fulfill Article 40’s requirements if the surgery for losing reproductive ability has not been permitted? The Supreme Court of Appeals stated in a May 2007 verdict that the decision by the Court of First Instance is correct. It also rejected the applicant’s request for a correction in the ruling in October 2007. The applicant took the case to the ECtHR in 2008, complaining about the content and the interpretation of the law. In the proceeding which started 2 years later, he underlined that the relevant requirement of the law can only be fulfilled by a surgery, leaving him in an inconclusive situation. Although it was proven by medical reports that the applicant identifies as a man and his physiology does not fit his gender identity, it was not enough for the court. The applicant claims that his right to privacy, designated in Article 8 of the European Convention on Human Rights, has been violated. The legal impact depends on whether the ECtHR will accept the case and their justifications. If it is accepted, the Committee of the Ministers of the Council of Europe will monitor the implementation of the decision and perhaps mention the case in Turkey’s Progress Reports. This may lead to a discussion to amend the law, however, such amendments take time. A person who wishes to change their gender may request permission to change their gender by applying in person to the court. However, for the permission to be granted, the applicant must be 18 years old and must be unmarried. The applicant must also be in a transsexual nature and must document the necessity to change their gender for their mental health and that they are permanently deprived of reproductive abilities through an official health committee report obtained from an education and research hospital. Depending on the permission granted, once the gender reassignment surgery fit for the aim and medical methods has been completed and verified by an official health committee report, the court decides to make the necessary changes in the population registry. Deputy Prime Minister Bülent Arınç stated that there is no discriminatory legislation against LGBTs in Turkey’s Universal Periodic Review in Geneva. Arınç stated that the fact that there is no special regulation for LGBTs does not mean that their rights are ignored. Member states of the United Nations submitted their recommendations in Turkey’s second Universal Periodic Review on 27 January 2015 under the auspices of the Human Rights Council. Common recommendations were on the freedom of expression and assembly, violence against women, gender equality, and independence of the judiciary. The delegations of Croatia, Germany, and Slovenia submitted recommendations on the recognition of the right to conscientious objection. Recommendations on non-discrimination based on sexual orientation and gender identity were put forth by 11 states. In the first-cycle of the Universal Periodic Review, Turkey had received only 5 recommendations on this issue. Uruguay, Argentina, Brazil, Canada, Chile, Croatia, Denmark, Finland, Israel, Norway, and Slovenia’s recommendations included the need for legislation on non-discrimination and hate crimes based on sexual orientation and gender identity. Belgium, the United States, Czech Republic, Spain, and Switzerland submitted advance written questions. These are non-discrimination based on sexual orientation and gender identity [Belgium, Czech Republic, Switzerland], training for government employees on equal treatment for LGBT persons [USA], and the current punitive system of the Turkish Armed Forces which considers homosexuality and transsexuality as diseases [Spain]. Deputy Prime Minister responsible for Human Rights Bülent Arınç stated that they try to “have democratic relations with everyone no matter their identity”. Arınç said, “There are no discriminatory legislation against LGBTs” and that the lack of a special regulation for LGBTs does not mean that their rights are ignored. Arınç noted that the Constitution’s Article 90 stipulates that international agreements duly put into force bear the force of law and that the Istanbul Convention includes the term sexual orientation. Arınç also said that effective investigations on hate crimes against LGBTs are in place and that claims of “unjust provocation” reductions are incorrect. 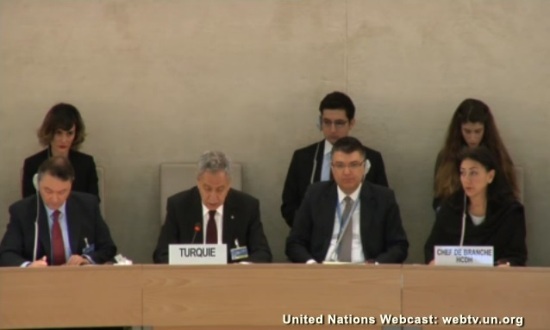 There were mistakes in the Turkish translation at Turkey’s Universal Periodic Review. The translator used the terms “sexual preference and social identity” instead of “sexual orientation and gender identity” when simultaneously translating the recommendations. Ezgi Koçak from Kaos GL Association observed the session in Geneva and spoke on behalf of LGBTI News Turkey and Kaos GL at a Law Society and Civicus side-event on the freedom of expression in Turkey. Koçak had shared the joint LGBT submission “Human Rights Violations of LGBT Individuals in Turkey” with LGBTI News Turkey’s Zeynep Bilginsoy at the UPR pre-session in December. Turkey received recommendations on its human rights record for the second time since the first-cycle in 2010. In the first-cycle, former Deputy Prime Minister Cemil Çiçek had claimed that the prevention of discrimination against LGBTs was under the protection of the Constitution. In 2010, Turkey had accepted recommendations from Norway, Canada, and the Netherlands to implement non-discrimination laws based on sexual orientation and gender identity. Turkey had also noted the Czech Republic’s recommendation to provide training to public officers on human rights, including sexual orientation and gender identity. Since its first review, Turkey failed to implement these recommendations on non-discrimination based on sexual orientation and gender identity. Even though the Istanbul Convention, which Turkey ratified in November 2011, include the terms sexual orientation and gender identity in its article on non-discrimination, Turkey must bring its domestic laws in line with this convention to fulfill its international obligations. 27 Ocak 2015 tarihinde, Birleşmiş Milletler’e üye devletler Türkiye’nin 2010’dan bu yana tutulan insan hakları sicilini inceleyecek. 2010’da devlet cinsel yönelim ve cinsel kimlik temelli ayrımcılıklar üzerine sicilini iyileştireceğine dair güvence vermişti. Fakat o günden beri LGBTİ kuruluşları Türkiye’nin bu alandaki başarısızlığını belgeledi. 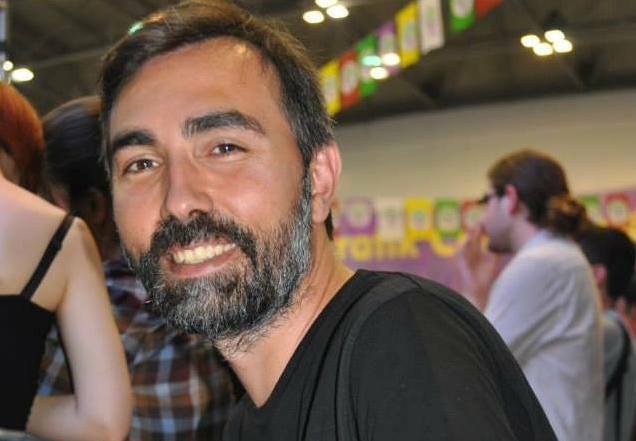 İnsan Hakları Konseyi’nin gerçekleştireceği Evrensel Periyodik İnceleme’nin (EPİ) ikinci turu Türkiye’nin 2010’daki ilk turda kabul ettiği tavsiyelerin bir takibi niteliğinde olacak. Türkiye’nin ikinci periyodik değerlendirmesi İnsan Hakları Konseyi EPİ Çalışma Grubu’nun 21. oturumunda gerçekleştirilecek. İnceleme altındaki diğer ülkeler gibi Türkiye’nin EPİ süreci farklı bölgesel gruplardan seçilmiş üç konsey üyesi ülke tarafından yürütülecek: Gabon, Küba ve Suudi Arabistan. Bu üçlü, Türkiye’nin EPİ sürecinde raportör olarak hareket edecek. Üye ülkeler, sivil toplum tarafından belirtilen görüşlerle birlikte Türkiye’nin insan hakları sicili hakkında Birleşmiş Milletler üyesi diğer ülkelerin de tavsiye ve sorularını gündeme getirecek. Türkiye’nin ikinci EPİ turuna katkıda bulunan yerel ve uluslararası sivil toplum kuruluşlarının sayısında ümit verici bir artış görülmüştür. LGBTİ kuruluşları da bu harekete katkıda bulunarak “Türkiye’de LGBT Yurttaşlara Yönelik İnsan Hakları İhlalleri” başlıklı belgeyi İnsan Hakları Konseyi’ne sunmuştur. Gazetecilere, gelecek EPİ incelemesi hakkında bilgi vermek amacıyla IGLHRC, KAOS GL ve LGBTI NEWS TURKEY tarafından hazırlanan “Arka Plan: İnsan Hakları Konseyi Evrensel Periyodik İncelemesi’nin Türkiye Değerlendirmesi” kuruluşların internet sitelerinde bulunabilir. Uzmanlar süreçle ilgili medya tarafından sorulacak soruları cevaplamaya da hazırlar. Türkiye’nin ikinci periyodik incelemesi Cenevre’de Birleşmiş Milletler İnsan Hakları Konseyi’nde (Palais des Nations, Oda 20, 09.00) 27 Ocak’ta gerçekleştirilecek ve oturum http://www.upr-info.org/en/webcast adresinde canlı olarak yayınlanacak. Oturumun video arşivi, ilk oturumun arşiviyle beraber http://www.upr-info.org/en/webcast/Turkey adresinde bulunabilir.